Fisheries and Livestock Minister Narayan Chandra Chanda has said that the government will lift ban on hilsa export soon. The minister came up with the information while responding to reporters at the conference room of the ministry on Monday morning after a press briefing. "We want to export hilsa, as its production has increased as well as demand in the international market," said Narayan. 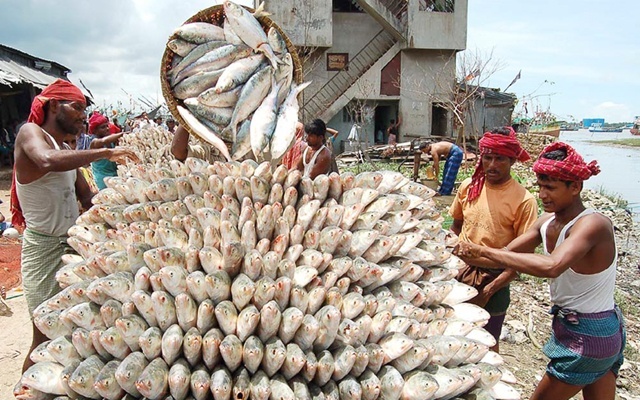 On August 1, 2012, the government imposed ban on hilsa export. The minister also said that there is no need to import meat in the country now as the government has a plan to be self-sufficient in meat production. "The price of meat is reducing at the markets and we expect that it will continue," he said. Narayan said that the government will take steps to reduce the price. But it will not be possible to reduce price like the past. 'However, we will bring the meat price under control within 1-2 years," he said. The minister said the government has already taken a project titled 'Beef Cattle Development' for increasing meat production. Besides, the Livestock Department has also started work to produce 'Proven Bull' through "Breed Upgradation Through Progeny Test", said Narayan. Besides, the minister said that country's fisheries sector contributed to about 3.61 percent in the gross domestic product (GDP) in 2017 which was one fourth of total agricultural production. "The 'Blue Growth Economy' has already been included as 'Pilot Country' in sea economy of Bangladesh," said the minister at the press briefing.